2Today I wanted to share with you a birthday guest book album I've been working on using the Lucky Paper Pack and Howdy Stamp Set through CTMH. 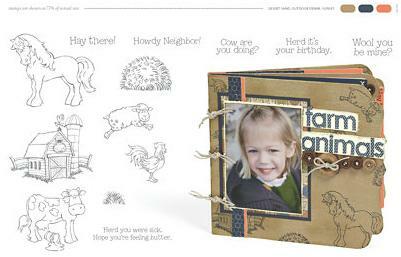 This cute little farm book is inspired from the Spring/Summer 2011 CTHM Catalog. Although, this example is using on the CTMH board books, I decided to make a cover of my own using the dessert sand paper and my own book board. I've placed the video here, were you can watch and see how I design a variation of this farm inspired book. Is It Back To School Already? Baby Shower Advice Book & Photo Album in one!